Lazy Magnolia Brewing Company has so far impressed me with the few beers I have had from their list, which is Southern Pecan (not reviewed), Deep South Pale Ale (not reviewed), Timber Beast, and now Jefferson Stout. This beer really caught my attention with the words Sweet Potato Cream Stout in the name. I checked their website and it appears that the recipe for this beer was created by one of Lazy Magnolia’s early supporters who is a chef. I don’t think I have ever seen beer brewed with sweet potatoes before this one. I’m sure there are some out there, but just not sold down here in my area of Texas. For this beer I used a beer mug, or seidel, stein as some might call it. 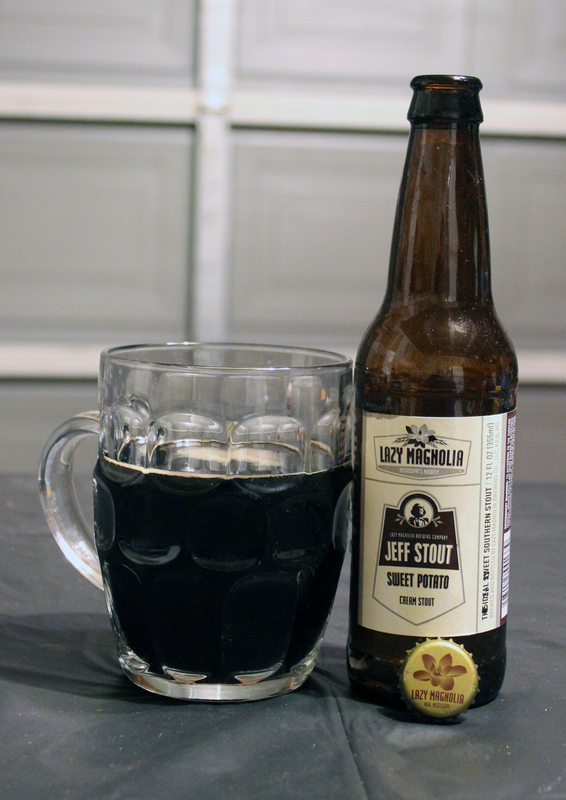 Jefferson Stout, or Jeff Stout as it appears on the label poured a very deep black color, but it did not appear to be a thick beer. A beer mug was one of the recommended styles of glass for this beer, but when I poured it in, there was no head present at all here, just a tiny thin line around the top of the beer, leaving absolutely no lacing. Maybe I need to try to pour this beer into a pint glass instead, as the other recommended glassware, and see what happens there. No worries, I will carry on. Interesting aroma with this one. There is a sweetness that hits me right up front, like milk chocolate. There are also aromas of brown sugar/molasses, caramel, and light coffee. The sweet potato make its presence known on the end of the smell. The smell of the sweet potato isn’t very overpowering, and it compliments the other aromas quite nicely. It leaves a sweet, very faint pumpkin-like smell lingering. The taste starts off with sweet milk chocolate, lactose cream followed by a body of brown sugar/molasses, caramel and some coffee flavor. Again, like the aroma, the sweet potato is present in the taste as well, with it’s comparable flavor to pumpkin. Seriously though, it is very faint, and almost, and I mean almost not there at all. I had to focus on finding it, but it is there, and don’t get too excited when I say pumpkin, and try to compare it to a pumpkin ale, cause it won’t be the same. The body was a bit thin for a stout. I was expecting this to be thicker, but like I said earlier, even the appearance of the beer, I could tell that this was going to be a bit thin. The mouthfeel was a little creamy, but mostly watery. It did have a slightly dry finish as well. Overall, I will say that I wanted to enjoy this beer a lot more than I did. I was thrown off by the thin, watery body, and mouthfeel. I also really wanted the presence of the sweet potato to be more powerful in this beer. I think this beer has potential to be a real winner with a few tweaks. Quite possibly though, I may have received a bad pack or something. I have read other reviews that say this is a full body, heavy flavored beer with great appearance with a thick head and good retention, so who knows. I wish we had this on draft, as that would be a great way to sample this beer. I guess I will wait until next time I see it available here as it says this is a year-round beer. I would really like to give this one another go, as Lazy Magnolia’s other beers were good. Metal Connection: Holy Hell was this one a bit hard to do. I don’t know any band that the words Lazy Magnolia, sweet potato, or Jefferson Stout made me think of. Well, maybe the word “lazy”, that is almost every band! I did a thorough, and deep searching for Metal bands from Mississippi only to come up short on a lot of searches. Then all of a sudden I remembered one band that had an album out on the Brutal Death Metal label, Unmatched Brutality Records that was from Mississippi. That band is Bloodchurn, a sick gore lyrics band that played Brutal Death Metal at it’s finest. I remember when their only album, Ravenous Consumption came out in 2005, there was a heavy rise of the Brutal Death Metal movement in the underground, ultimately causing a overflow, making the scene almost comical as some bands were just a joke. The reason I can sill stomach bands like Bloodchurn is that they don’t just play slam riff after slam riff. There is some groove in their music. Take a listen, I’m sure you will find yourself nodding your head while the song plays. Here is “Point of Origin” by Bloodchurn from Gulfport, MS. METAL!!! !